St. Clairsville, OH (May 3, 2018) – Belmont College officials conferred degrees upon a multitude of graduates as part of the college’s 2018 Spring Graduation Ceremony in St. Clairsville, Ohio. Hundreds of parents, extended family, faculty, and staff were present to congratulate the Class of 2018. 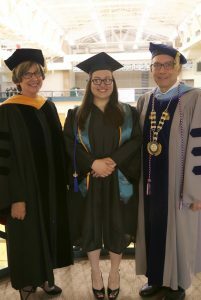 Belmont College’s Class of 2018 Valedictorian Megan Turner (center) of Bellaire, Ohio is pictured with Dr. Rebecca Kurtz, Vice President of Academic Affairs & Student Learning and Dr. Paul Gasparro, President. “Remember, no matter how far or how high you travel, you started here and you have a great foundation to build on. Tonight is your night and I hope that you enjoy and celebrate it. We are very proud of your achievement and wish you good health, happiness, and continued success in whatever path you choose for your future,” Gasparro added. The keynote speaker at the commencement ceremony was Mrs. Ginny Favede. Ginny Favede currently serves as Executive Director of the Ohio Valley Construction Employers Council, a tri-state contractor’s association, as well as the Co-Chairwoman of Project Best, a construction industry labor-management organization encompassing over five hundred contractors and six thousand building trades craftsman and apprentices serving the Upper Ohio Valley region. In 2017, Favede was appointed by Governor Jim Justice to the West Virginia Design-Build Board and is a member of the Executive Board of Directors for the Ohio Democratic Party. She served as the Belmont County Commissioner for the last eight years and five years as a City of St. Clairsville Councilwoman. Favede is a graduate of The Ohio State University, where she earned a BA in Political Science. 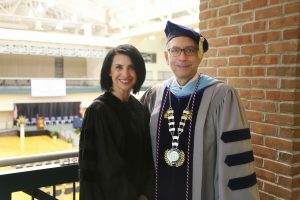 Belmont College’s 2018 Commencement Speaker, Mrs. Ginny Favede, Executive Director of the Ohio Valley Construction Employers Council, pictured with Dr. Paul Gasparro, President. The Class of 2018 valedictorian is Megan Turner of Bellaire, Ohio. She earned an Associate of Applied Science Degree in Criminal Justice as well as a Legal Office Specialist Certificate. She earned a grade point average of 3.989 and graduated with honors. Turner also serves as a member of Phi Theta Kappa (PTK), the International Honor Society for two-year colleges. The class salutatorian was Rachel Ladner of Zanesville, Ohio, who earned an Associate of Applied Science in Library Paraprofessional. She achieved a grade-point-average of 3.987 and graduated with honors. Ladner is also a member of PTK. Additionally, a pinning ceremony was held prior to commencement to honor the 43 graduating Associate Degree Nursing students.